Lord Byron compared Matlock Bath with Switzerland, and the name stuck. This scene is often called "Switzerland View". Looking south and down into the Dale, showing the houses directly opposite High Tor and the bridge that led across to the colour works. 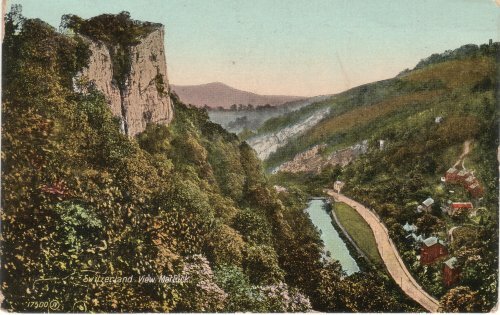 The view was registered by J.Valentine in 1892 as "Steep cliff above river running through densely wooded valley, with bridge at mid distance and houses on hillside beside road".